The Nutrition Project from Projects Abroad is what attracted 22-year-old graduate in Nutritional Sciences Kyra Loehnis to the Sacred Valley in Cusco, Peru. 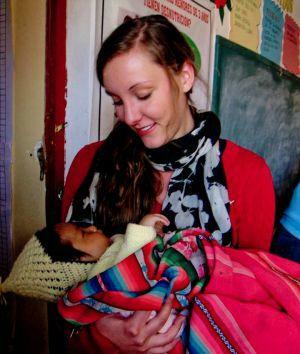 As a recent graduate from the University of Arizona, Kyra had time in between her bachelors and masters programs and chose to take this opportunity to travel and volunteer. workshops, volunteers also accompany facilitators on house visits monitoring the well-being of the participants. Kyra felt that these experiences within the program were ones that she will carry with her into the future. She was able to learn a lot about adapting to a new culture which is something that will be very beneficial to her in the future. Some of these cultural differences that she found to be most interesting were the differences in food, social habits and moral values. Spending a great deal of time working with local people helped Kyra improve her Spanish. “I absolutely loved the small town life in Urubamba. Being able to walk a few blocks in any direction to find anything that I needed was very convenient as well as safe. There is a certain closeness about the town that is contagious; the people are welcoming and friendly.” Kyra was able to enjoy the city life with other volunteers on the weekends and was also able to travel throughout Peru. She especially felt close to her host family who welcomed her and took her in as one of their own. “The Abal family showed me true happiness and love and welcomed me with open arms. They taught me Spanish and about Peruvian culture, but most importantly they taught me to always smile and laugh,” said Kyra. Kyra feels that the best part of her trip was the people she met; her co-workers, mothers she worked with, volunteers and her family. “It was a great experience to hear about different walks of life and form friendships with people from all over the world.” Kyra’s advice to future volunteers is to travel as much as possible, spend as much time with your host family as possible and to not be afraid to put yourself out there whether in work or making friends.